Fresh off the nation's basketball championship and a stellar parade to honor the Golden State Warriors, the Bay Area's newly dubbed "First Family," spent the Father's Day weekend getting pedicures, enjoying their toddler and attending a party for their soon-to-be-born baby. The day before Father's Day, Ayesha Curry posted a photo of her and Steph Curry getting pedicures at a nail salon. On Instagram, she wrote she had the most "wonderful day date with my love. Foot massages, Thai food and a pedicure." 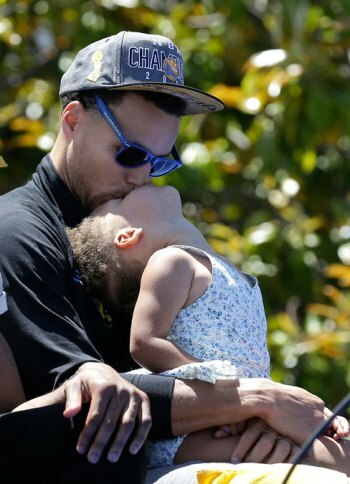 Stephen Curry kisses his daughter Riley during a rally for winning the NBA basketball championship. As for being a great father, Ayesha Curry posted on Sunday that her husband is the most "amazing husband anyone could ask for," showing photos of the Warriors' guard, nicknamed the "Baby Faced Assassin," holding pictures of the couple's toddler when she was just days old, and then again, kissing Riley Curry, now 2, while both were at the NBA championship parade in Oakland on Friday. Steph Curry also used a photo from the parade day to give a shoutout to all the dads out there, especially his, Dell Curry, saying on Instagram that he woke up to Riley's feet kicking him in the back, and "wouldn't have it any other way." VideoDaughter of Former Dubs Coach: "I'm the Original Riley"
Steph Curry will have a chance to be a father, again, soon. His wife is pregnant with her second child, due next month. Friends also threw them a baby shower over the weekend. Had the most wonderful day date with my love. Foot massages, Thai food and a pedicure!!! ������ yesssssa @wardell30 yes!